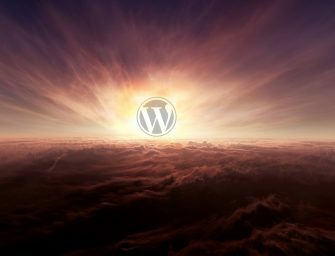 WordPress gives us the tools to crack the nuts we have. It also holds in case of real estate and renting services powered by WordPress. Let’s check out WordPress themes in these fields that are nomineted to be the best 10 in 2017. All the functions you can imagine when it comes to real estate service website is integrated in RealArea. 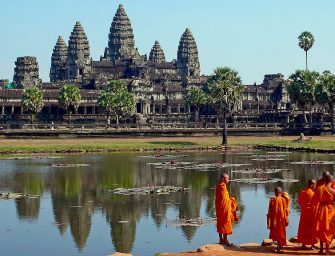 It can easily tackle multi-languages by using the proper plugin. The fully responsive theme has been designed and continuously updated especially for real estate agents and agencies, brokers, and other oganisations. High-quality photoshop PSD pages makes it impressive, its coding is easy as breathing. Multiple home pages (3+), numerous inner pages (15+, e.g. Ajax contact form, about, blog etc. ), 27+ PSD designs are included. In addition, an Advanced Property Search function is also given when you buy this beautiful theme. Visitors can search for real estate properties by bedrooms, size, location, price, and many other attributes. Revolution Slider plugin is also integrated with unlimited color options. You don’t need to be a dreamer ‘gazing through the window at the world outside’ in searching for a better than good property WordPress theme, Dream Palace is here to stay. 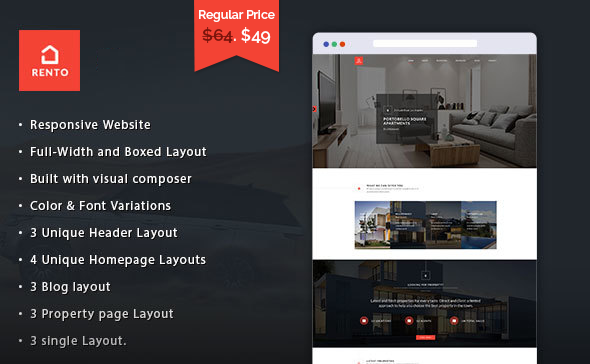 This fully responsive and retina ready theme using Visual Composer offers you 4 home page variations (Multiple page site as well as Single Page Parallax site option). Since it is entirely google maps-compatible, you can add nearby places by langitute and latitude to give the big picture for your clients about the additional values of the given proporty (restaurants, groceries, shops, hospitals, schools, important transport stations etc.). SVG icons are available for easy customisation, plus WPML plugin is also given (multilanguage and RTL support). You will actually like it, your customers will actually fall in love with it. 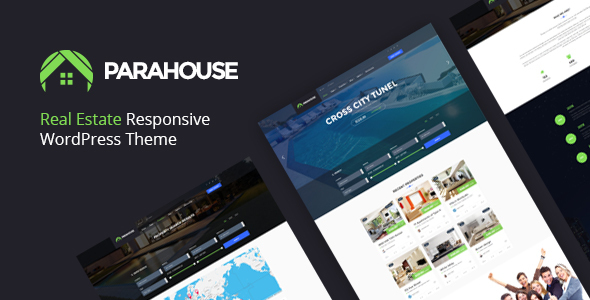 Given the fact that ParaHouse WordPress theme looks and functions actually stunning, it is highly suitable for building up Property Agents, Renting Villa or Apartments websites. 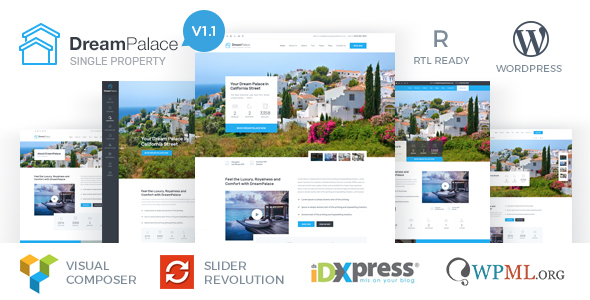 It is fully responsive and retina ready, Slider Revolution and Visual Composer plugins are freely included. In addition, 2 featured plugins from Opal Team are also integrated: Opal Estate & Opal Membership. Parahouse’s advanced search option is well designed and very detailed in terms of filters. 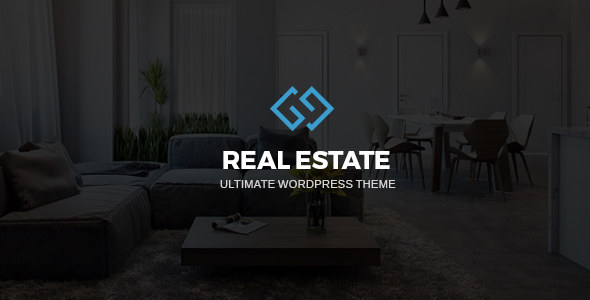 Rento is an innovative real estate WordPress theme specifically designed for agents, agencies, and companies dealing with real estate, and rental services. Having a fully responsive bootstrap framework, this theme will bring great e’lan into your business. It offers 4 different home page layouts (full-width and boxed layout), 3 unique headers, advanced search filters for houses and properties, WPML and BuddyPress compatibility, retina readiness, just to name a few features. 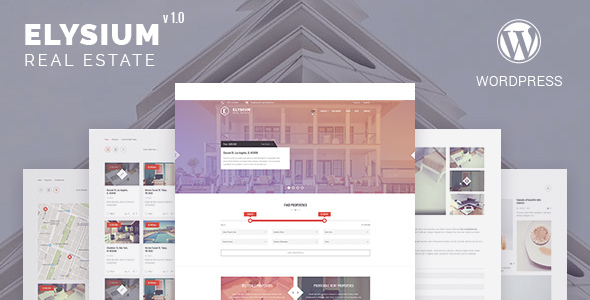 Elysium is the latest professional WordPress theme dedicated to real estate business that can be put into the shopping cart. It manifests as a superclean, responsive & easy-to-use template having a set of specific features: Bootstrap 3 Grid, Cross Browser Compatibility, Google map/font, Responsive Design, Smooth CSS & JS animations. Yachts and even sailing boats can often be considered as comfy moving properties. 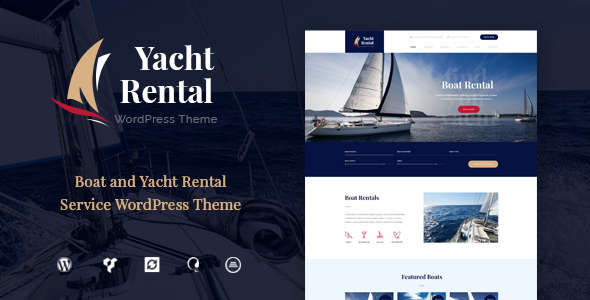 Yacht Rental is a stylish WordPress theme by which you can present an online yachts, boats rental services. You can use it to sell / rent single object or modify it as a corporate page for any sales / rental agency. The theme includes an elegant catalogue where each of the objects is presented in a user-friendly way. A series of wonderful features are included at your disposal spanning from the detailed rental search filter and powerful options panel, through color management system to comprehensive set of shortcodes and visual page composer. 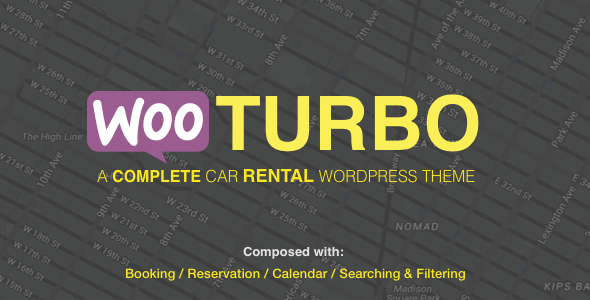 Do you want to create a car renting-specific WordPress website for a company? Or are you the owner who needs one of those? You are at the perfect place: Wheelsberry is the excellent choice. 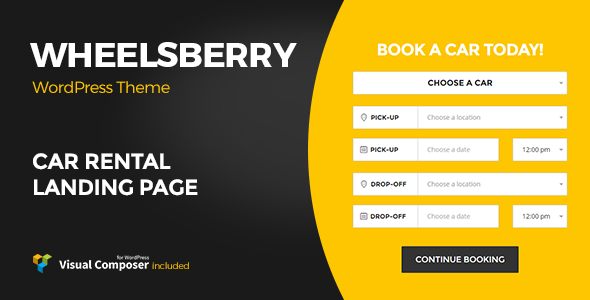 Beyond the fact that Wheelsberry is a fully responsive and well designed theme, its customizable car booking form with catchy car slider is quite unique and impressive. It provides a wide range of opportunities to give more experience to your customers, you can show various parameters of the cars including the number of doors, passengers, and that of luggages, the type of transmission, the option of air conditioning and the extras (excess protection, additional driver, GPS navigator, child seat, baby seat etc.). Of course, it includes Visual Composer and is WPML compatible as well. 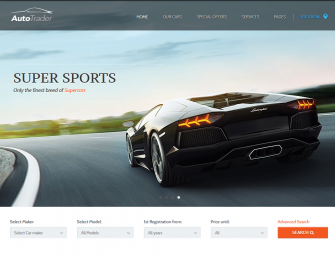 This user-friendly car booking theme has been crafted with WooCommerce booking plugin, Visual Composer, and multilingual option (WPML). This theme allows your clients to smoothly use your booking or rental services. It enshrines a variety of features, such as easy WooComerce booking system, car listings together with searching & filtering options, availability checking & date blocking, payment gateway, coupon/discount options, translation readiness, plus 3 plugins from CodeCanyon. 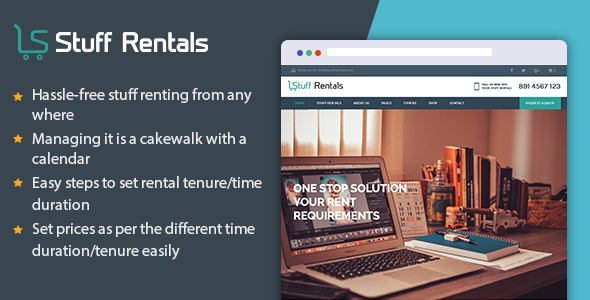 In the spirit of shared economy, Stuff Rentals WordPress Theme has been dreamed to provide you a platform to run an online stuff rental business in the most efficient and organized way. Just display the properties and stuff to be rented out in a categorized and beautiful way and attract/manage your clients. The theme is responsive and customizable, and has been powered by BootStrap and is designed to be responsive. The theme is also laced with Visual Composer using which it is easy to create pages with a host of features. 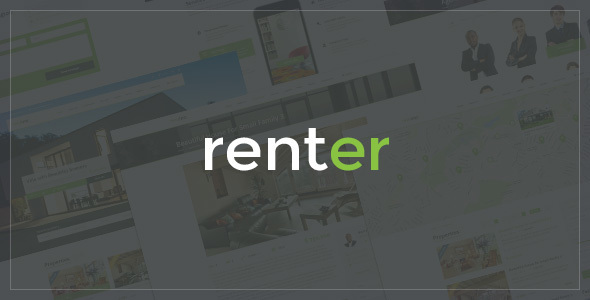 Renter is highly recommended for real estate agencies, realtor or any other website related to Houses, Apartments, Townhouses etc. It opens new dimensions to advertising and selling/renting the properties through fullscreen slider (video also supported). It offers among others 6 different module styles, cross browser compatibility, 50+ widget positions, and the theme is built on WARP framework and UIKIT. 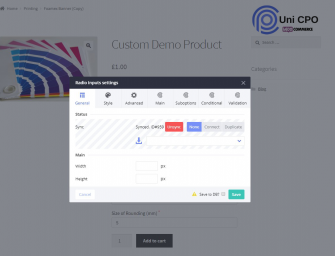 Real time customizer makes the management easier.